You'll never take food for granted after seeing Margaret Atwood's dystopian future in The Handmaid's Tale, where every mouthful is somewhere between the Lord’s bounty and bitter ashes. In case your reading list somehow omitted this feminist parable - a piece of fiction designed to leave its readers sitting in bed at 2am, hair standing on end, eyes staring, reaching for the nearest lady's undergarment and a lighter - it's a terrifying campfire story fabricated entirely out of things that humans have actually done to each other in the name of religion and control. In Atwood's Republic of Gilead - the smoking remains of the continental United States, a rigidly-controlled cross between Quiverfull and George Orwell's 1984 - the few remaining fertile women are forced to bear children for theocratic leaders and their wives. Our hero, Offred - played by Elisabeth Moss in the adaptation by American company Hulu - is handmaid to the high-ranking Commander Waterford (Joseph Fiennes) and his wife Serena Joy (Yvonne Strahovski, or to give her her formal Australian title, 'Our Yvonne'). In a world where every thought is policed, every action scrutinised and every freedom curtailed, the pleasures of the flesh are off the table - with one exception: food. "Did you see? They have oranges. Praise be his bounty." I don't need oranges. I need to scream. I need to grab the nearest machine gun. Hulu's series beautifully contrasts the casual face-stuffing of the 'before-times' of our daily lives - food trucks, morning pancakes, restaurant queues, coffee shops, fancy lunches - with the affected near-Amish kitchens and bland, frugal food-stamp rationing of Gilead. The handmaids' only moments of relative freedom are their trips to the biblically-named supermarkets - Loaves and Fishes, All Flesh, Milk and Honey - harshly-lit, advertising-free and with shelves sparse enough to be straight out of North Korea. Jar labels have pictures of their contents - women in Gilead are forbidden to read. Food shopping is yet another reminder of the handmaids' changed lives. Food shopping is one of the few normal activities the handmaid's are able to do. The table in Gilead is a front line of class warfare. For the high-ranking Wives, it's all fine china, white linen, high-tea treats and grapes. State events are catered with the obsessive detail of a 1970s Women's Weekly spread, all tiny over-fancy canapés and wine - the last vestige of meaningful power for a Gileadian Wife amounting to impressing political guests with the quality of their smiles and complexity of their biscuit biscuit toppings. Commanders sip outlawed whisky with impunity. In the domestic kitchen, the servant-class Marthas make bread from scratch - not because they need to, but because rejecting mass-production and handing labour back to serving women suits the biblical affectations of Gilead. For anyone not at the top of Gilead's pious heap, men and women alike, it's bland porridge, eggs, black-market cinnamon and noses pressed against the glass. The handmaids are controlled and bribed with food by the commanders' wives, fed treats like children or pets. In the absence of anything else to do, most of the handmaids spend large swathes of time daydreaming about ice cream, or jealously inhaling the rare smell of real coffee. Food is one of the few meaningful currencies and comforts among the handmaids. Take a beating, and a handmaid might find a little something extra on her breakfast tray from her compatriots. It's also, like every gift or small pleasure in Gilead, instantly suspect - a courtesy or a trap. Hulu has gone all-out to make you feel the hunger of Gilead, and really, truly savour your freedom to step out for a burger whenever you like, but don't expect the show to exactly mirror the book. Atwood's Offred might get to occasionally enjoy a canned pear, or spend a couple of pages obsessively savouring her boiled eggs, but Moss' Offred is made of tougher stuff. If you're looking out for the butter - the famed moisturiser of last resort in Atwood's novel, palmed off a dinner tray and squirrelled away in a spare boot, to be applied as a small sensual indulgence despite the smell - you'll be disappointed. Moss has bigger things to worry about than the chapped state of her own skin - a fiercer fighter than Atwood's more introspective slow-boiled frog. It's never made clear exactly what brought about the demise of fertility in Gilead's Earth - both reproductive and crop-wise - but Atwood saw no reason to limit her dystopian famine to any one apocalypse, and neither did the producers of the series. Nuclear winter, climate change, war, farming practices, overfishing - take your pick. 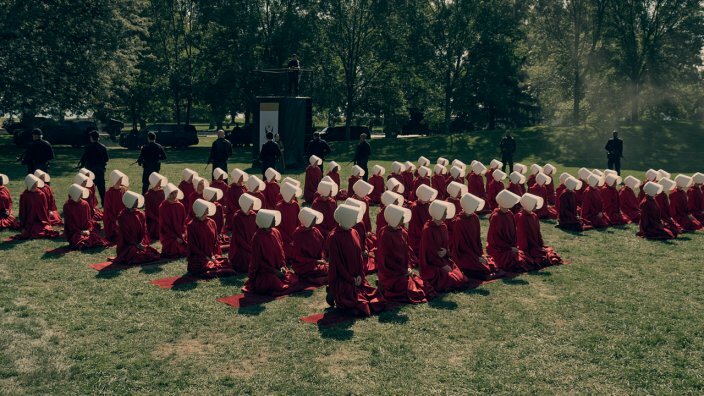 The standard greeting between handmaids in Gilead - ‘Blessed be the fruit’ - is a biblical slice from Deuteronomy: “Blessed be the fruit of your womb, the produce of your soil and the offspring of your livestock, the issue of your herds and the young of your flocks”. If one is willing to overlook a bit of slavery, the handmaids are just another of Gilead’s productive farming techniques in a starving world. So make some popcorn, smother it with precious butter, settle in on the couch and savour every moment of this excellent show. The Handmaid’s Tale is making its Australian debut exclusively on SBS On Demand with all ten episodes available to stream in full from July 6. We're not just saying that because it's on SBS On Demand. Everything you need to know before watching the adaptation of Margaret Atwood's classic novel. Costume designer Ane Crabtree explains her inspirations for the different looks.